If you take your route from 34 27.400N　134 09.500E to the green port entrance buoy at 34 28.100N　134 10.900, you will hit seaweed farm rafts. Then, you have to turn widely south to circumvent the rafts before the port entrance. Passing by the green buoy at 34 28.100N　134 10.900E, head to the true north. A big ship is moored at the ferry terminal quay. Behind the quay, there is an old partially-inclined pontoon, at which you may moor your boat alongside. As its fenders were dropped and big bolts are protruding, be careful when you are mooring. Water is at the ferry waiting area. Toilet is at a big supermarket nearby. Provisions: Everything at the big supermarket. A bathhouse is next to the big supermarket. 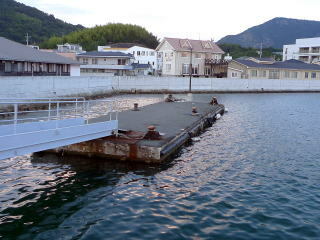 Note: As Tonosho Higashi Port is open to the sea, my boat was rolling a little bit. 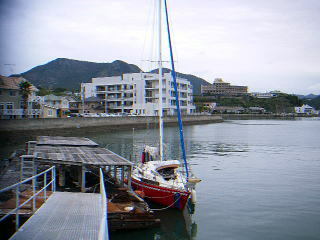 Local sailors say that Ojimae Fishing Port located in the east of Tonosho Higashi Port is calmer. Mooring at an open space of the fishing port will be OK, they say. 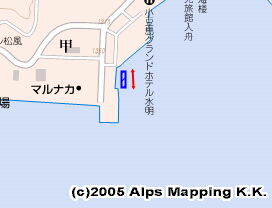 You may try the fishing port. Shodo-shima Islands consists of two towns: Shodo-shima Town and Tonosho Town.